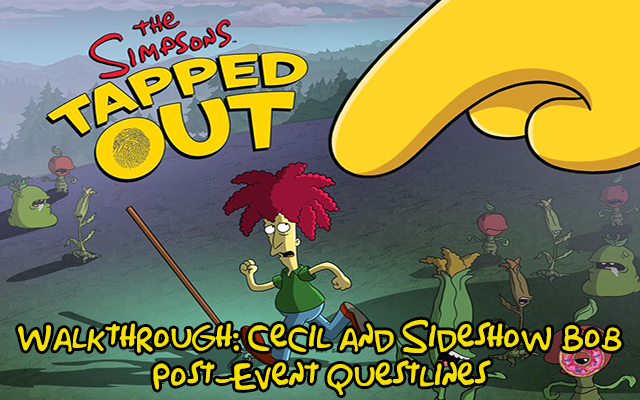 In this post we’re going to guide you through the questlines that were added for Cecil and Sideshow Bob. Mr. Terwilliger, the recent events caused by Monsarno Corporation have left our town a shambles. Which is not to say they are not still a valued corporate partner. Keep those campaign donations coming, boys! I can assure you that Monsarno will do whatever is necessary to cover up– I mean, repair– the damage. Although some of the ugliest crapshacks may have to be simply demolished. Why is everyone looking at me there? Moe’s Tavern — where urban blight meets methanol-tainted loss of sight. Aw, c’mon, my place ain’t that bad. There’s no foundation, the coasters are made of asbestos, and the back room is filled with giant rats. The back room is filled with BABY giant rats. The giant giant rats live in the basement. Mr. Szyslak, as part of Monsarno’s program of urban renewal, your tavern is headed for the wrecking ball. But my bar is a beloved institution! At least give me a chance to show you how friendly and welcoming it can be. Very well. I owe you that much. You hear that, the rest of you suckbags? Get out of my bar while I entertain this jerk here. I think this will be my new hangout! After all, why should my brother be the only one who gets to go to a bar where everybody knows your name? Your brother was a famous barfly? Well, in a TV series from the 1980s. But at this point the Tapped Out writers will rip off anything. What’s the buzz, Mr. Terwilliger? The thing that I’ll have after you get me a beer. And so ignorant about fair liquor pricing. Bad news, beloved fellow barflies. The planning commission still wants to tear Moe’s Tavern down. They think it’s a blight on the community. How dare they throw that in my face?! Because they think your face is an even worse blight on community. And Moe, my brother Bob can help you. By giving me tips about using theatrical makeup to hide my blemishes? No, by slicing off your face and replacing it with someone else’s. Your tavern has never looked more beautiful, Moe. And neither have you. Yeah, your brother glued a heck of a new face on me. I can’t stop smiling. He used too much glue under the lips. Where’s the rest of the barflies? Got rid of them. With this classy new jernt, we don’t need ’em. Maybe we should jump ahead to Season Five, when I get the hell out of this bar and never return. 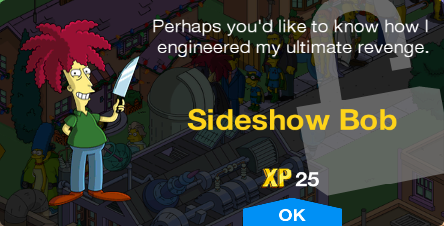 If you didn’t unlock Sideshow Bob in the event, a new questline, Flaw and Order, needs to be completed before this one starts. Good news, Bart. The psychopathic killer who has dedicated his life to your death has escaped from prison. Sideshow Bob escaped?! How is that good news? You get to stay home from school until they arrest him. Wow. I hope my murderer escapes more often. Well that isn’t going to happen. We’re going to catch Sideshow Bob and put him in the most secure solitary confinement we have: “The Glass Cube”. Nothing can destroy it, except its natural enemy: rocks. Enjoy the Glass Cube, Sideshow Bob. I’ve never seen a villain escape from such a place. Then again, I never watch the movies. Hey, I just saw Sideshow Bob running around free again. I thought you put him in “The Glass Cube.” You said it was inescapable. It is. But it’s also really expensive. You can’t believe what we spend in glass cleaner alone. So we stuck Bob back in medium security. He may escape a few more times, but eventually he’ll get the message. Unless he kills you first. Then I guess he won’t get the message. Back to jail, you sidekick from Hell. Chief Wiggum, I just saw Sideshow Bob on the loose yet again! I thought you put him in a medium security prison. He was really wrecking up our prison. So now we have him sitting in the police station guarded by a really mean dog. Actually, kind of a nice dog. We were scared to have a mean dog around the station. Okay, don’t give me that look. I hate it when children give me that look. You’re wasting your time. You can’t keep me in jail. That’s where you’re wrong, Sideshow Bob. You’ll never escape again. I mean, really, it’s exhausting. You’ll be good, right? I’m gonna call that a “yes”. After unlocking him, a new quest starts, if you had him in the event or unlock him after. As though it had been blown to smithereens, and then clumsily reassembled by some knucklehead with zero clue about how to lay out a town. But if this is a different Springfield, then perhaps I am a different Sideshow Bob, no longer cursed with the obsession to kill Bart Simpson. Only one way to find out: spying on the Simpsons from the bushes around their house. Hm. Apparently my love of creepy stalking hasn’t changed. I’ve been spying on the Simpsons for hours, and I still feel absolutely no urge to murder Bart. Apparently whatever idiot blew away Springfield also blew away my hatred. Wait! I feel a strange disturbance in the cloud. Somewhere, someone is calling me an idiot. That’s not strange. Somewhere, someone is always calling you an idiot. What a delightful zing by the lad. And look how nimbly he dodges his father’s ape-like hands and skateboards away. If that’s not worth an amused maniacal chuckle, I don’t know what is. Principal Skinner, it’s a brave new world, and I’d like a job at your school. Perhaps I could teach gifted and talented students about the Shakespeare play where the phrase “brave new world” comes from. The only thing my students are gifted and talented at is troublemaking. I have the whole fourth grade on lockdown. Well, I’m also highly familiar with the Federal penitentiary system. Hm. With you in charge, I could join my birdwatching group in its hunt for the variegated nuthatch. The nuthatch? An aerial daredevil of jaunty plumage indeed! You’re also a nuthatch nut? You’re hired. I just need a job reference. Call Cliff “The Grim Reaper” Franklin at this number. But I’d do it before Tuesday at midnight. His appeal is not going well. What a wonderful teacher Sideshow Bob is. He has a real soft spot for teacher’s pets. I guess being blown into a fog of atoms and then reconstituted in a world ruled by a giant sky finger really can change a man. I don’t trust Sideshow Bob. Today he tried to look past my bad behavior and reach me as a fellow human being. What kind of teacher does that? He MUST be a phony. And there’s one last test I can do to prove it. System Message: Purchase Sideshow Bob’s arch nemesis, the Rake, to continue the plot! If you earned rakes during the Terwilligers Event, or bought them, the questline from Sideshow Bob Rake It to the Limit One More Time continues. We’re going to analyze the last 2 parts in tomorrow’s premium guide and walkthrough. This is all for now, join us tomorrow for the premium guides and walkthrough, happy tapping! did you check the census? Since the conclusion of the event and the update my “Herbicide Squirter” has reverted back to level 0, has anyone had this happen to theirs? Monsarno and the Opera Stage kept their levels. Checked my towns and the FHS is on 0, opera and MR shows levels. Previous Level 53 has been released!